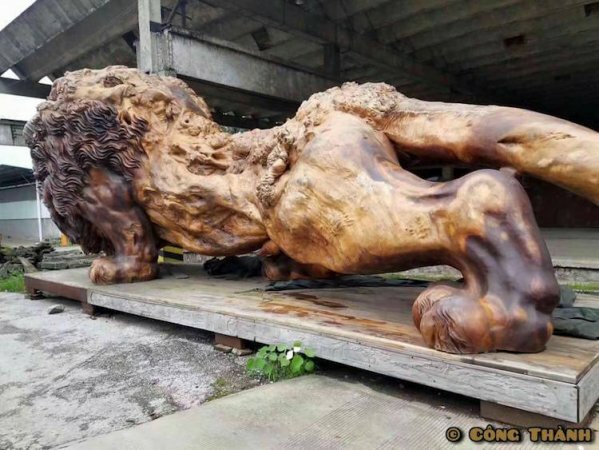 Taking 20 people more than 3 years, a single tree trunk has been carved into a giant lion titled Oriental Lion. Sculptor Dengding Rui Yao led the team in carving out the enormous redwood trunk, which is now located in Fortune Plaza Times Square in Wuhan, the capital of China's Hubei Province. The artists worked on the mammoth sculpture in Myanmar before it traveled a little over 3,000 miles in December 2015 to China. Measuring in at 47.5 feet long, 16.5 feet high, and 13 feet wide, the giant lion is the world's largest redwood sculpture according to Guinness World Records. Oriental Lion‘s head, paws, and tail have been sculpted into a smooth finish, with the torso maintaining the trunk's rough texture. It's unknown if the wood was sourced from China, but we certainly hope it was a tree that was sick or dying rather than being chopped down for the project. If it did come from China, it's most likely a Metasequoia, a fast growing tree found in the Hubei Province. The use of the lion in public sculpture is a clear choice given the animal's significance in Chinese culture. As a symbol of power, they are often used at the gates of palaces, temples, and tombs to ward off evil spirits. Since its installation in Wuhan, the giant lion has become a favorite new monument in the city. 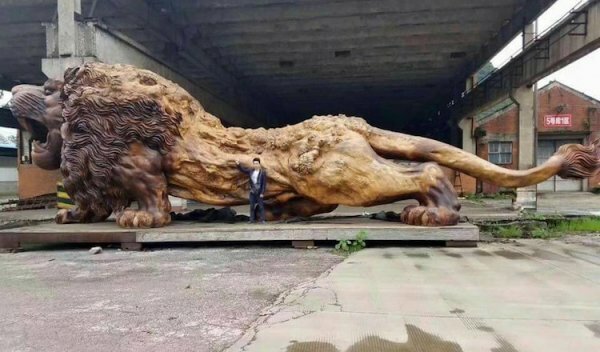 The giant lion sculpture in China is carved from a single tree and holds the record for the world's largest redwood sculpture.